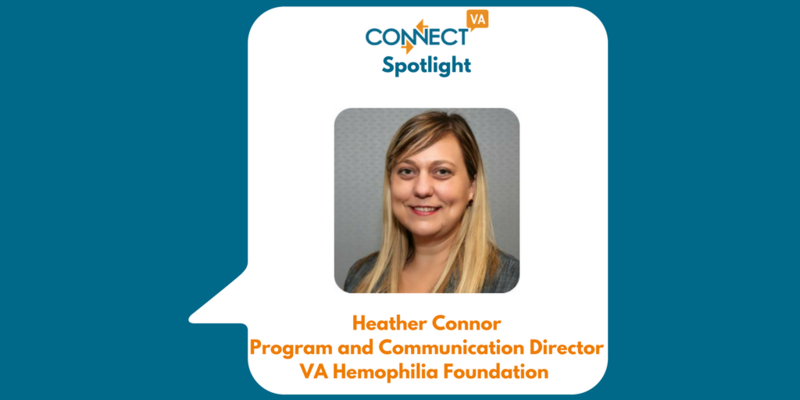 My name is Heather Conner and I serve as the Program and Communication Director for the Virginia Hemophilia Foundation (VHF). I moved to Richmond in the 90’s to attend VCU. I started off studying Anthropology and along the way met many Religious Studies professors that captured my attention; so much so that I stuck around, took more classes and ended up with a double major. A year of service with AmeriCorps solidified my passion for serving the community and in a roundabout way led to the work that I do today as Program and Communication Director for the Virginia Hemophilia Foundation. The focus of our work at VHF is to serve the entire Virginia inherited bleeding disorders community by supporting the needs of those impacted by a bleeding disorder through education, advocacy, and community. The needs of the community vary, but due to the nature of inherited bleeding disorders (chronic, expensive, and very rare), we strive to build connections between our community members to increase the social health of patients and their families by decreasing isolation. For some, the first time they met anyone else with a bleeding disorder was at one of our events! ABOVE: A video that was conceptualized, designed, shot, and edited by VHF teens at the 2014 Teen Retreat. It was based on that year’s World Hemophilia Day theme 1 in 1000. The direct connections and relationships that I have forged within the community. Since it is a small population it feels like family and I get to hear personal stories on a regular basis about how the organization is meaningful and adds value to their lives. A group photo that truly shows how VHF’s organization is like one big family; taken at the Annual Education Meeting in 2013 in Natural Bridge, VA.
Our major challenge right now is moving our funding from one that relies on industry donations and sponsorship to one that is based more on individual donors. We have been moving in the direction of online and peer-to-peer fundraising at our action based fundraising events (Bowling for Bleeding Disorders and Trick or Trot 5K) but have been running out of steam lately and are ready to hire a third employee to help our two-person office. We will be hiring in the next few months and are a great place to work if anyone out there is looking for a development position! People are most surprised to learn about how expensive the medications can be for a person with an inherited bleeding disorder. Costs for a child with severe hemophilia can be over $200,000 per year to treat bleeding with intravenous doses of the missing clotting factor. Some people build up inhibitors to treatment and costs can exceed $1,000,000 per year – this is just for medication alone. This is one of the many reasons why we have a history of strong advocates within our community. Recently an article in Vox talked about a parent in the community who was so persistent that she convinced former Senator Byron Dorgan to introduce legislation to end lifetime caps on insurance which became a part of the ACA. VHF members meeting with their US Representative for Virginia District 4, Donald Mc Eachin, at the National Hemophilia Foundations Annual Washington Days on March 9, 2017. I am in the process of working with board and community members to develop a teen leadership program. We have slowly built up a core group of teenagers that attend events and are active in our chapter and next steps are to formalize a program that would give our teens the opportunity to help develop new events/programs, receive advocacy training, get volunteer hours, and give them tools they can take away and use in their everyday life. We hope to then use this program to one day develop a junior board and/or committee that would report to the board at large and inform them of any new ideas or initiatives that they would like to see for the youth of our community. Are you and/or your organization involved in any exciting collaborations or partnerships? We are always open to partnership and find a lot of meaning in collaborative work. We currently have on-going working relationships with the National Hemophilia Foundation, the Hemophilia Federation of America, the Hemophilia Association of the Capital Area, Camp Holiday Trails, and our Hemophilia Treatment Centers at CHKD, UVA, and VCU. Group photo from the 2016 Camp Young Blood, which VHF provides each summer for our members at no cost at Camp Holiday Trails in Charlottesville, VA.
We find ConnectVA/The Community Foundation to be a valuable resource to our small operation of just 2 employees. 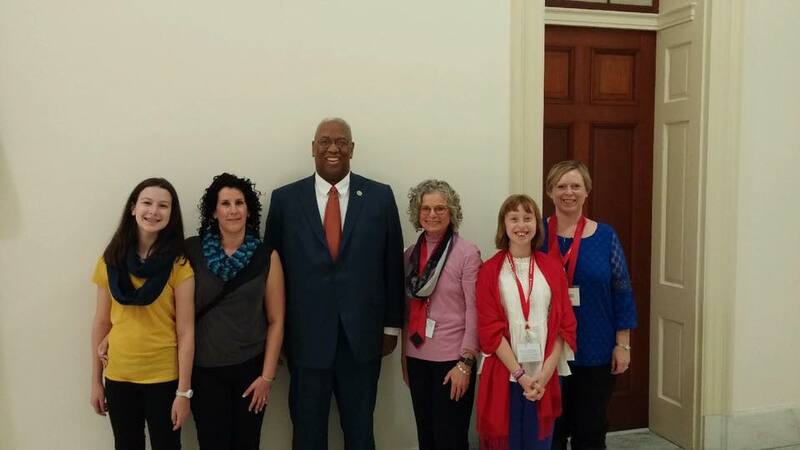 We are reminded of this as we interact with other bleeding disorder chapters throughout the country; we are lucky to have such a robust and supportive non-profit community in Richmond and ConnectVA/The Community Foundation is at the center of it. We use our Give Richmond profile when we want to share easy to read financial and management information about VHF, we utilize ConnectVA for sharing events and for hiring new employees, also we love the opportunity for professional development that we receive through non-profit management classes offered and both our ED and myself are graduates of the ENLP program. I love my job and feel honored to be able to share my gifts with our community in meaningful and creative ways – there is never a dull moment in the non-profit world and I would not have it any other way! This is a lot of hard work and dedication. Thank you Heather for looking out for those who deserve the same chance as every citizen and making sure they have the resources to do it.